Riding your bike in the rain is an experience to say the least. Believe it or not, there are a few of you crazy cyclists who actually enjoy riding in the rain. 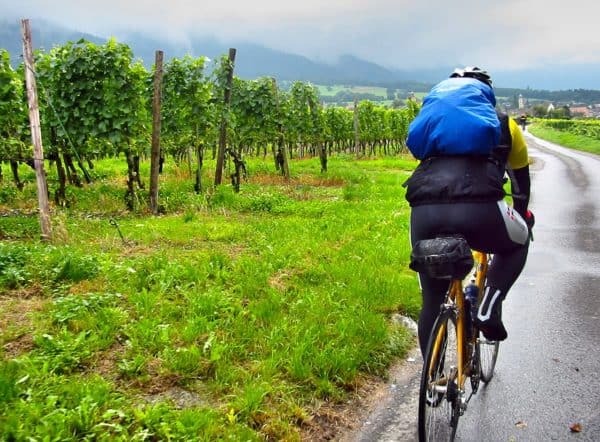 Most cyclists would rather ride under fair weather conditions. That’s how I am. I would choose to ride in the sunshine over the rain any day. I can only think of a handful of times when I willingly chose to ride in the rain. Most of my rainy day bike commutes were out of necessity. The first time I biked from work in the rain I was not prepared. It didn’t rain in the morning, but by the time work was over it was pouring cats and dogs. I was dressed in regular clothes with a simple jacket. My 20 minute commute home would be a 20 minute shower. Hoping to avoid the commute I called friends trying to get a ride home, but no one was able to help. With no other options I poked three holes in a giant plastic garbage bag. One hole for my head, the other two for my arms, and put it on hoping that it would provide some sort of coverage. I looked homeless, but determined to get home I mounted my bike and took off. Even with the plastic garbage bag I arrived home soaked. It was a memorable ride, and I laugh about it now, but since that day I have prepared myself for biking to work in the rain. Never again will I commute without the essential rainy day gear. 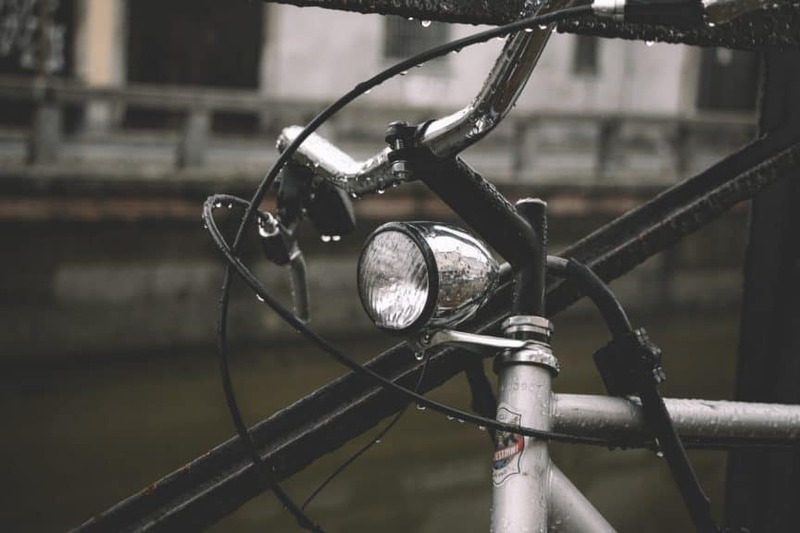 This article will outline tips on how to bike to work in the rain, and also highlight important gear to getting to your destination safe and dry. Bike commuting in the rain is definitely doable, and these are the tricks and tips to make it easier, safer, and drier. Bike riding in the rain is inherently more dangerous than a non-rainy day. It is important that you take the proper precautions to ride as safe as possible in this weather condition. I share this not to scare you, but to make sure you take rain riding seriously. 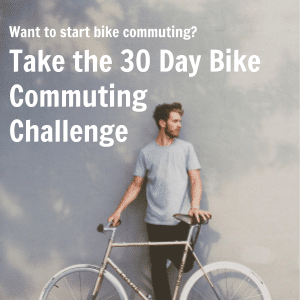 I am a huge fan of bike commuting, and think most people would have a healthier and happier life if they did it. Rainy weather should not be a deterrent from riding to work, but you should be aware of the dangers (slick roads, motorists having a harder time seeing you, puddles, etc.) so that you can prevent yourself from any type of accident. The only serious crash I have had was on a day in which the ground was wet. Looking back I could have prevented the crash if I knew what precautions to take. All this to say, keep safe and take the following tips to heart! Keep your eyes on the ground, and watch for spots that may be more slick than normal. Be extra careful with painted lines or markings on the ground. You know that white line that distinguishes the bike lane? Treat it like fire. That white line is a guaranteed spill. Be extra diligent to scout the area that your tires are going over to make sure you don’t find yourself going sideways in a split second. Other bike commuters have also warned against manholes saying that riding on them can lead to a slipper crash. One last observation – the first rainy day in a long time is the day when the roads are slickest due to oils, grease, and dirt on the roads. Be extra careful riding on the first day of rain. As a kid I loved to blast through puddles on my bicycle. Even to this day when I am driving my car I have a hard time not gassing it to really make a splash in a puddle. While you may be insane like me and feel an urge to blitz into a puddle I would warn against it. The problem is that puddles can hide dangerous holes for your bike to hit. You don’t want to ride into a puddle only to hit a pot-hole and go flying head first. If you have no choice but to go through a puddle take it slow. Rain doesn’t only make things more difficult for bicyclists, but also those in vehicles. Rain can hinder the vision of a driver, and make it much harder for them to see you. Make sure you have your bike lights on, and if you own bright clothing it would be appropriate to wear those as well. Be extra cautious at street crossings making sure that motorists acknowledge you before you cross. Rainy days are not the time to try and break any personal records. Generally take the ride slower, being aware of your surroundings, and making yourself visible to others. In addition, you’ll want to take corners upright. You don’t want to go fast into a corner leaning. The only serious crash I have been in occurred because I took a corner too sharp and leaned too much. The ground was wet, and my bike came down in an instant. It cost me a broken collarbone. Keep upright and go slow on those corners! When it’s wet out braking will take longer than when it’s dry. Make sure you apply the brakes earlier than you normally would to accommodate for wet brakes. This is especially important when taking corners. Generally disc brakes are more effective in wet weather than rim brakes. With this said, rim brakes can be used effectively in the rain. You should feather the brakes to remove water from the rims which will allow you to brake easier. Before you take off riding in the rain give your brakes an inspection to make sure they are ready to go. Moisture can corrode and rust your bike and its components. Keep your chain well lubricated, and wipe down that bike after rainy rides! It’s not advised, but if you are leaving your bike outside in the rain you’ll want to put a plastic grocery bag over the seat. This way when you get back to your bike you can take it off and have a dry seat for your rump. Your first option for bike commuting is to embrace the rain, and wear clothes that you don’t mind getting wet in. Make sure to pack a clean, dry clothes in a place that can be protected from the rain, and change into them when you get to work. 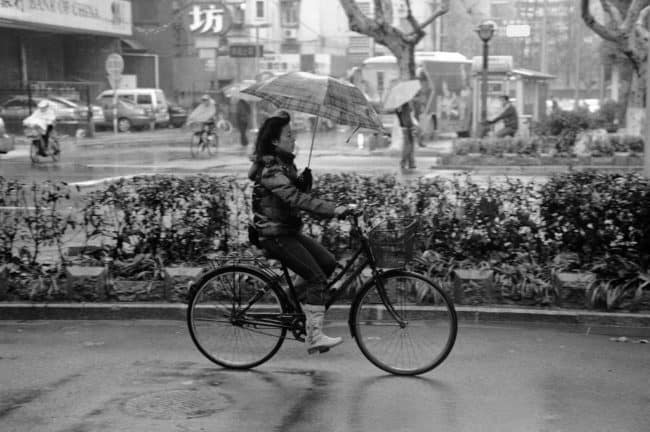 Many bike commuters take this approach, and don’t let the rain hinder them. They allow the rain to do it’s thing knowing that they have clean, dry clothes to change into at work. If you’re thinking of taking this option I would make sure that you do wear clothes on your bike that will keep you warm even if you get wet. Even if you’re fine with getting wet, it can be a miserable ride to work if you are freezing cold. You can disregard this advice if you are one of those rare people who have the skin of a polar bear and the cold has no affect on you. Lastly, we wrote an article about freshening up once you arrive at work from your bike commute. The tips in this article can help you look and smell good after riding to work in the rain. Personally I have never owned the “perfect” jacket for cycling in the rain. I did have a jacket that was waterproof that I wore, but it wasn’t ideal as it was not breathable. The rain didn’t get me wet, but my own body heat would cause me to sweat with that jacket on. The best jackets for riding in the rain are waterproof, but breathable too. You don’t want to be like me, and feel like you’re stuck in an oven because of your jacket. You are looking for something that will keep you dry from the rain, but also let your own body heat out. A great cycling rain jacket will also have some sort of reflective accents to make you more visible to motorists. Every cycling rain jacket has its own strengths and weaknesses, but these are the general characteristics you should be looking for. One of the popular rainy jacket options that bike commuters choose is the Showers Pass Waterproof Cycling Jacket (see price on Amazon). Rain Pants that are designed for bike riding are similar to the characteristics of cycling rain jackets. They’ll be designed to be breathable and have reflective accents. In addition, they’ll have ankle straps to prevent your pants from getting caught in your chain. Most rain pants are made to go over whatever pants you are wearing, and than to be taken off when you arrive at work. Personally I bought a pair of generic water proof pants from REI. They are not cool looking, but they get the job done. When you think of a rain cape or poncho do you imagine yourself wearing those cheap plastic covers that they sell at baseball games and amusement parks? Me too. The good news is that cycling rain capes don’t have to make you look goofy as there are many stylish options. A good rain cape or poncho can help keep you dry from the rain, but also be stylish too. I’ve put a list of 5 great cycling capes that can help you ride dry on a rainy day. Lights are important for riding in the rain. It’s harder for motorists to see you, and good lights will make you more visible. Obviously, you want to get a light that is water-resistant so that it won’t short out. There are a variety of companies (Planet Bike, Light & Motion, Cat Eye, Blackburn) that make lights that range from $20 to $250 dollars. The variance in price depends on the features, brightness, and battery life. I am a Light & Motion guy as they have their headquarters near my hometown. They’re the light company I went with, because I like to support local businesses and they offer solid products. 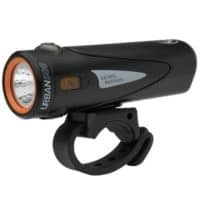 I use the Light and Motion Urban 500 (check price on Amazon) to get the job done. It’s waterproof, rechargeable, and bright enough (500 lumens). It is perfect for rainy days and also night rides. Besides a basic headlight you should purchase a couple red LED safety lights. You can get these for cheap at most bike shops or online. They won’t help you see the path around you, but they’ll increase the chances of motorists seeing you. I put one under my bike seat, and often attach them to a backpack if I am wearing one. For these items you’ll need a dry place to store them on the commute. Every bike commuter has a different preference, but you’ll want to have a waterproof backpack, panniers, or carry bag. Some sort of bag on the bike or on yourself that keeps its contents dry. If you already own panniers or backpack that isn’t waterproofed, and you are not excited about purchasing a new one there is another option. You can purchase a ‘dry bag’ for $10-$20 that you can put your items in and than put the dry bag in your already owned panniers/backpack/etc. Correctly setting up fenders will improve their effectiveness. You want fenders to have an even space between them and your bike tires, and to be as close as possible. Longer fenders are more effective at blocking mud and water. Not all fenders will work on every bicycle. Choose Fenders that have a mounting system that works with your specific bike. The more rigid a fender is the quieter it will be, and less likely to have it rub your tire. Generally speaking, metal fenders are more rigid than their plastic counterparts. Cyclists can be divided over whether to wear glasses in the rain. Some argue that wearing glasses during the rain doesn’t help, because the rain sticks to the glasses right where you are trying to see. Other cyclists like glasses, because they find that it helps prevent water from getting into their eyes. This seems to be a personal preference more than anything else. One tip I heard from other bike commuters is that a hat or helmet with a brim is a good replacement for glasses as it keeps the water from above out of the eyes. My preference during rainy days is to wear glasses, because I hate flicks of water getting into my eyes. I would rather have water stuck to my glass lens than my eyeballs. Glasses are especially important if you are riding on the wheel of another cyclist who’s back tire is flicking up water and grit. You don’t want that getting in your eyes. It gets annoying very fast. One question I have heard bike commuters ask is, “Do I need special cycling glasses?” The answer is no. Any clear glasses will do a good job of keeping rain out of your eyes. Unless you are storing your bike outside in the rain I recommend keeping a rag to wipe your bike down upon arrival. You want your bike to keep in the best shape, and a quick wipe down will keep it from getting rusty. Especially when you get home from a long day at work you’ll be tempted to put your bike away without cleaning it up, but this will drastically reduce the life of your bike. A quick clean up will go a long way at keeping your bike working for a long time. Make sure to not only wipe off water, but any grime or dirt that got on your bike. If you’re storing your bike at work inside you should put down a newspaper or towel under your bike to catch any drippage. You don’t want your boss complaining about the water stain or puddle that your bike left. Attitude is everything when it comes to biking to work in the rain. It will be wet, but you don’t have to let it be miserable. Be grateful that you get to exercise and be outside on this wonderfully rainy day! Put on your rain attire and view the commute as a grand adventure. I mean, how many of your co-workers are going to be able to enjoy the rain like you did today? Attitude is truly everything when it comes to riding in the rain. Remember being a child and getting excited to stomp in puddles? This is the grown-up version of puddle stomping! You get to ride through the rain! 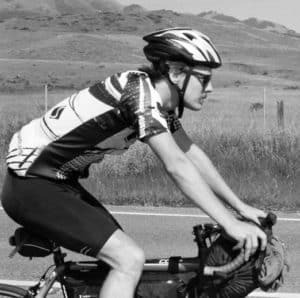 I hope this article gets you out of your car and onto your bike! Rain can be an excuse to not bike commute to work, but it shouldn’t be. 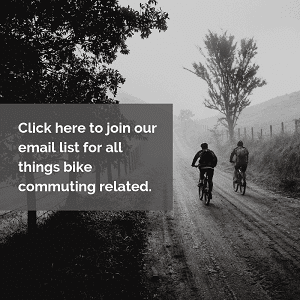 With the proper knowledge and gear most people can ride to work even on a rainy day. Enjoy your rainy ride! Stay safe and make sure you have the essentials for a rainy day bike commute.